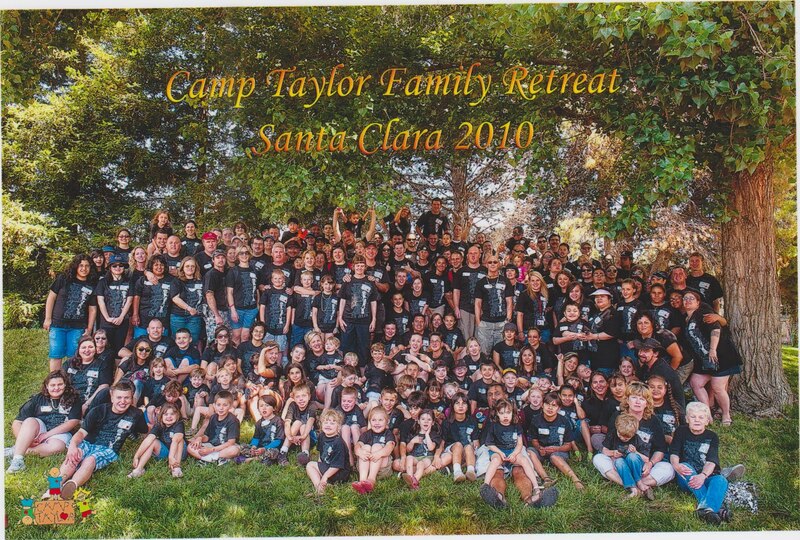 We were finally able to attend Camp Taylor! Lots of confusion, lost registration and then an opening at a camp that was around the time of Ava's Cath and a possible third OHS prevented us from attending last year, and I was super heartbroken about it. BUT, it all worked out this year and we even got to attend the same camp as Miss Ava's heart and digeorge bff Madison and my digeorge/heart parent ROCK, Michelle. As well as the rest of the Stone clan. 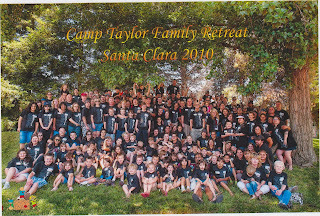 Other heart family friends have shared their stories and pictures of their experiences at Camp Taylor family camp, and was VERY excited but didn't know exactly what to expect since the "camp" we were attending was actually at the Hilton in Santa Clara. Usually it is outdoors in a more camp-like setting and they have activities such as kayaking, archery, relay races, obstacle courses and stuff. Of course, the two G's were hoping for some roller coaster action at Great America(the hotel was literally right next to the theme park), annnd they got their wish! We arrived at the Hotel at about 3pm, check in time. Our mentor came and greeted us immediately and then we separated and got situated in our room. Took a look at the itinerary...WOAH. They keep you busy with activities from 8am(thank YOU Hilton for having Starbucks available in the lobby), to 9-10pm. The first day there we had our family photo taken, then went to do our first craft, making a family banner. I usually get sort of all perfectionist when it comes to this sort of thing, but decided to just let the kids do their thing and have a good time with it, for once. ;P And they did a most excellent job, too! They must get it from their mama. Then we went to another room for MORE arts and crafts time. Ava had fun with this, using scissors and glue and all the messy craft elements. G, not so much, but he was an excellent sport and played along very well. Then it was dinner time. Each meal was catered and served buffet-style. During dinner time, each family introduced themselves and their families and shared the diagnosis of their heart camper. It is still so surreal to be surrounded in a room full of families who have gone through so much of what we have. When Ava was first diagnosed I absolutely felt SO alone and isolated, I truly never would of imagined there were so many others out there going through the same thing. After dinner each night they usually let families and/or campers go up on stage and share songs, talents, etc. Super cute. The next day was GREAT AMERICA time! Greg and I were trying to remember when the last time we had been there was, and I think we concluded that it hasn't been since before children. So we were all excited to spend the day together at the park and meet later for lunch with the group. The boys went off on a few roller coasters while Ava and I checked out the rest of the park. Not too many rides for her, as she isn't tall enough yet, but we found a few. :) Plus, they now have a Snoopy Zone and Ava is ALL about "puppies!". The weather was luckily really nice, which was great for Ava, and for the rest of us who were wearing BLACK heavy cotton shirts(camp shirts). After lunch we all gathered for a group photo, then it was just the heart campers and siblings time. WOW. Another one of those moments, so proud and in awe of every single one of those kids. They were seriously the happiest, friendliest, most energetic bunch I have come across! So inspirational, and they don't even know it. On the final day the kids got to make build a bears, and many families shared testimonials of their time at Camp Taylor and what it has meant for them. So moving(Tiff, fyi, the tear count was up to about 10 at this point ;P). At the very end each family was presented with amazing little gifts to remember their time at camp by, a scrapbook and mouse pad made by the mentors, an iron on transfer using the family photo taken upon arrival, and each heart child received a shadow heart buddy. It's a special doll that has the heart scar down it's chest. Ava fell in love instantly and the doll, along with the bear she made, haven't left her side yet! What a week it has been! To catch up everyone, Miss Ava successfully completed her first year of Preschool! I am so very proud of her, and so thankful to her fabulous teachers who helped her accomplish and conquer yet another little milestone. We lucked out with these three fantastic ladies! :) Luckily for us, they will also be teaching the extended year summer school program Miss Ava is enrolled in. So glad they are running the program this year, plus Miss Ava having the same friendly faces will definitely help her apprehension she will undoubtedly have after a couple of weeks off. Another huge huge HUGE milestone Miss Ava reached quite some time ago but was just made official two days ago, the Mic-Key is OUT and her stoma closed all on it's own within 24 hours! Ava has been eating on her own since fall of 2009. Getting her to take her medicine orally was the biggest hurdle, but she does it so well now. She is 100% off that nasty pediasure, eats usually anything we give her, and takes a daily multivitamin and just half a baby aspirin for meds. WOW! From the little failure to thrive baby with paralyzed vocal cords who aspirated and couldn't handle her own secretions that was 100% reliant on similac pm 60/40 and later pediasure for nutrition, to a healthy 4 year old who can't go over 45 minutes without needing a snack, this mama is SO beaming with pride!